Michelle Larae LOVES Vegas, her hometown for most of her life. It’s no wonder with it’s flashing lights, celebrities, and gambling, but Michelle loves Vegas for its old, downtown historical charm as well. Michelle stays super active, and can be seen across Vegas getting into trouble at local bars and doing a ton of different things from bowling every Monday night to cruising around town with her bike gang “Hammer and Cycle”. Michelle is currently having her own Ford truck built for her. Read below to get to know this bombshell a little bit better and check out some awesome photos by Photographer Trent Sherrill. Hot pinup girl, drving a hot truck… not sure if it gets much better than that. What part of you does your truck represent? Well for starters… it couldn’t be more girlie! Cotton candy pink, metal flake and sparkles everywhere – and lace! So you’re an avid bowler… would you say you can get competitive? Crazy competitive (a la Monica from Friends) or healthy competitive? Competitive… YES! I’m a Taurus, it’s in our nature… even when we aren’t good at something (such as me and bowling) we still play to win… or at least BEAT anyone we can! Growing up in Vegas…what wild n’ crazy things did you find yourself getting into? Any crazy stories you have for us? To be honest with you… growing up in Vegas really is just like any other place. Boring I know, besides the chance celebrity encounters like seeing Mike Tyson jogging past your bus stop every morning or seeing Andre Agassi at the local market… LOL! But you have that in L.A. too! Not only are you having your own Custom truck built, but you belong to a bike gang? What? LOL! Well… as I said before, it’s a “bike” gang in the literal sense, we ride bicycles! LOL! I personally ride a 1968 Sears beach cruiser that’s all done up in hot pink metal flake, complete with matching streamers! You live in a period correct vintage home (awesome) what’s your favorite part about it? What kinda cool vintage finds do you have on display? One of my prides is my baby pink vintage refrigerator and 15 point Sputnik lamp that’s original to the home and a pink bathroom… which if you know anything about 50’s homes, that’s considered a trophy piece! If you want more of Michelle check her out on Facebook. You can follow her Bike Gang Hammer and Cycle on Facebook too. 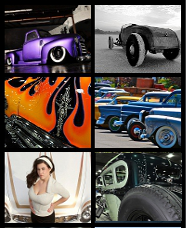 For more great Pin up and Car images check out Classy Never Trashy photography by Trent Sherrill.